From Perth we embarked on our adventure, first stopping in Merredin for a night, then a few days in Kalgoorlie visiting family. Brimming with fuel, water and food ready for our cross country journey, we left Kalgoorlie and headed for the Nullarbor. We’ve done the Nullarbor a few times here, here and here but have always been in a bit of a rush. Keeping with tradition, this time we are also in a bit of a rush to get to Melbourne to catch Sharni’s brother before he goes on Christmas holidays. 90 mile straight, the longest straight bit of road in the world, looks quite unremarkable just like any other long straight bit of outback road. Perhaps the curvature of the earth is to blame, but it just disappears seemingly quite close over the horizon. It’s interesting to watch trucks in the distance slowly rise from below the horizon. Despite the time constraints, I really wanted to get off the Eyre Highway, camp for a couple of days on the beach, relax, get into camping rhythm, de-stress and catch a few gargantuan Mulloway. So we headed to Twilight Cove, where a remote beach south of Cocklebiddy meets the cliffs of the Great Australian Bight as they turn inland. The track to Twilight Cove can be picked up behind the Cocklebiddy roadhouse. There’s a few tracks around – take the track on the eastern end that passes the garbage dump. When you see the signs for Twilight Cove / Eyre Bird Observatory a few hundred meters behind the garbage dump you know you’re on the right track. The track into Twilight Cove starts off pretty tame. It’s a bit slow going over the rocky bumps but easy enough for any vehicle. Don’t be fooled, it get’s tougher further down the track. The track starts off as fairly level hard packed sand and rock. It all changes during the decent down the scarp (the inland remnants of the sea cliffs). Damn that’s a tricky plunge down quite a steep and uneven slope. I dunno if it is always this bad or if there had been recent water damage, but the track is badly rutted and seriously uneven. Tyre placement had to be spot on otherwise you’d fall into a rut, get stuck, damage the car or even roll over. From there you enter dune country. There’s a few soft sandy dunes to climb as the track weaves its way to the beach. We didn’t make it up this climb first go. Reduce tyre pressure, try again. The sun was getting low as we made our way through the dunes towards Twilight Cove. There hadn’t been anyone down the track for a while because there were no tyre tracks through the dunes. We got a bit lost at one stage and had to climb the dunes on foot to figure out the route to the beach. We found a suitable route without too much drama and soon we broke out from the dunes. Wow Twilight Cove is amazing. The hair raising drive down the scarp started the excitement. Then some fun dune bashing with no tyre tracks to follow made the journey feel like a serious expedition. Then to come out to such a picturesque spot, with powdery white sand that squeaks when you walk on it, the cliffs in the background with the sun setting, the vastness of the cliffs and the dunes and the beach, and to be in such a remote location that is even more remote than the already very remote Nullarbor Plain, with no signs of humans for miles around, I felt like a bit of an explorer discovering this spot for the first time. The sand here is exceptional. Very white, clean and very fine grained. It almost looks like icing sugar. Unfortunately it doesn’t taste like icing sugar. It’s not sweet at all and it’s still coarse and gritty just like ordinary sand. I gave fishing a go but the sea was a bit weedy and with the strong winds my rig would almost immediately be dragged through some weed. The weed is no where near as bad as some other spots along the southern coast, as you’ll see when we head towards Eyre Bird Observatory. In calm conditions fishing would be feasible at Twilight Cove and swimming too. I don’t know how often calm conditions come but I have a feeling that it’s not very often. From Twilight Cove we followed the beach east to Eyre Bird Observatory where we found this vehicle parked in an unfortunate position. I’ll be sure not to complain about too much seaweed again. This is seriously too much. At Eyre Bird Observatory we had a look around and had lunch with the friendly caretakers on the porch. 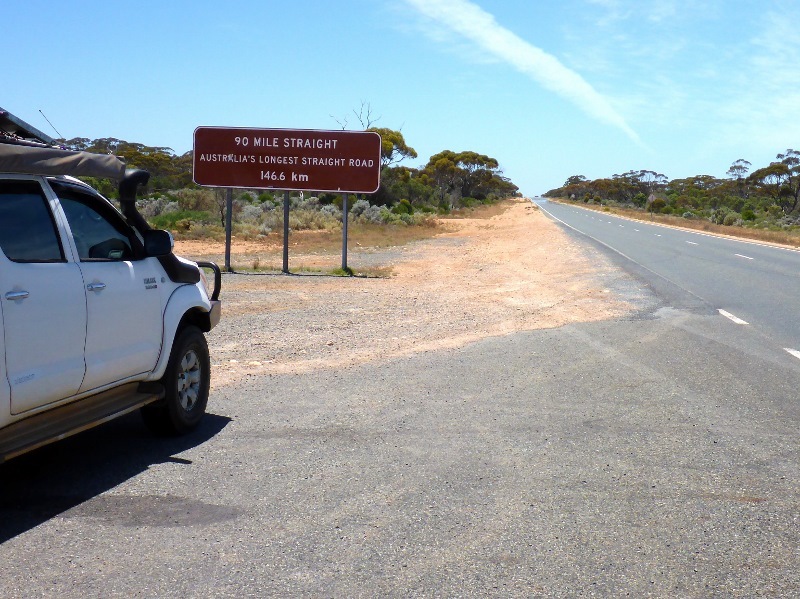 Then we took the track out direct to the Eyre Highway to continue our journey east. As we accelerated up to speed on the highway I briefly heard a funny grinding noise for just a fraction of a second. It immediately went away and never returned. I wonder what it was.